A trio of hunters in the Louisiana bayous capture a monster called the Swamp Thing. They take it to New Orleans where (naturally) they display it in a strip joint. 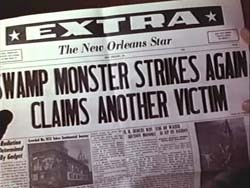 When the monster's favorite stripper gets into a fight with another stripper, he breaks loose and starts killing. Directed by Ron and June Ormond.